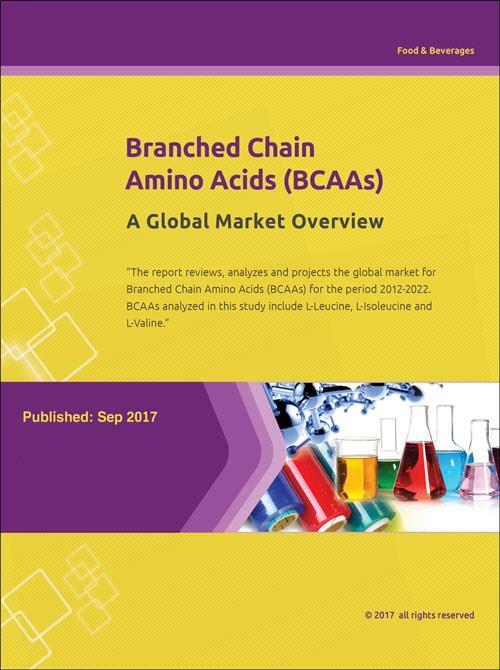 The global demand for Branched Chain Amino Acids (BCAAs) is projected to grow with a CAGR of 12% during 2017-22 period, driven by outstanding growth of L-valine in animal feed sector and sustained growth of three BCAAs in sports nutrition industry. Ever since L-valine’s introduction as the next limiting amino acid in protein diets for animals, demand for the same has been witnessing double digit growth rates and is further forecast to grow with a healthy 22% CAGR through the analysis period. The industry guide includes the contact details for 227 companies. The report reviews, analyzes and projects the global BCCAs market for the period 2012-2022 in terms of volume in metric tons, market value in US$ and the compound annual growth rates (CAGRs) projected from 2017 through 2022. 1.1.1 What are Amino Acids? Fuyang Dongchen Biological Engineering Co., Ltd.
Henan Julong Bio-Engineering Co., Ltd.
Jiangsu Xinhanling Biological Engineering Co., Ltd.
Jinyao Ruida (Xuchang) Biology Technology Co., Ltd.
Jizhou Huaheng Biological Technology Co., Ltd.
Meihua Holdings Group Co., Ltd.
Ningbo Create-Bio Engineering Co., Ltd.
Ningbo Haishuo Biotechnology Co., Ltd.
Shantou Jiahe Biological Technology Co., Ltd.
Shijiazhuang Jirong Pharmaceutical Co., Ltd.
Shijiazhuang Shixing Amino Acid Co., Ltd. Shine Star (Hubei) Biological Engineering Co., Ltd.
Wuxi Jinghai Amino Acid Co., Ltd.
Yichang Sanxia Pharmaceutical Co., Ltd.